Will Law and Justice win this year’s elections in Poland? Poland’s ruling party, Law and Justice, has based its appeal on claiming to offer socio-economic stability and prosperity while downplaying controversial issues to avoid mobilising its opponents. Aleks Szczerbiak writes that ahead of parliamentary elections later this year, the party retains a lead in the polls and is still viewed as more credible than the liberal-centrist opposition on the issues citizens care most about. The coming year will be a crucial one for Polish politics as the autumn parliamentary election could be the most important and consequential since the collapse of communism in 1989. Having set the political agenda for the previous three years, the right-wing Law and Justice (PiS) grouping, Poland’s governing party since autumn 2015, found itself on the defensive throughout much of 2018. The year began with a sweeping government re-shuffle by Mariusz Morawiecki, a respected former banker who replaced incumbent Beata Szydło as prime minister at the end of 2017, having earlier served as her finance minister. Law and Justice was hoping to re-focus the government’s priorities on to economic development and improving its international standing, particularly within the EU. The ruling party hoped that, having carried out difficult and controversial reforms during the first half of the parliament, a pivot to the technocratic political centre would win over moderate voters. However, almost immediately the government found itself on the back foot as a result of an accumulation of political controversies. Firstly, it faced a major crisis of international relations with Israel – and, as a consequence, the United States, the administration’s key foreign policy ally. This was prompted by the passage of a controversial anti-defamation law which made it a criminal offence to falsely ascribe responsibility to the Polish nation or state for the crimes committed by Nazi Germany. Israeli critics argued this could lead to the punishment of Holocaust survivors for their public testimony against Poles who harmed Jews during the German occupation, and the crisis was only defused when Law and Justice agreed to amend the law. This was followed by controversy over the generous bonuses paid to Mrs Szydło and other ministers which exposed the government to criticism that it was failing to live up to its claimed higher ethical standards; and once again Law and Justice was forced to climb down as ministers donated their bonuses to charity. The government also failed to close down its ongoing dispute with the European Commission over its controversial judicial reform programme. Brussels felt that the government’s concessions on this issue did not address its main concerns and continued with its action against Poland under Article 7 of the European treaties, which it can invoke against any EU member state where it feels there is a ‘systemic threat’ to democracy, as well as referring some of the reforms to the European Court of Justice. In the October/November local elections, Law and Justice’s hopes that its pivot to the centre would expand its support base in urban areas, and programme of large-scale social transfers mobilise swathes of (previously electorally passive) beneficiaries, failed to materialise. Although the ruling party won the highest share of the vote in elections to Poland’s 16 regional authorities, the best indicator of national party support, it performed poorly in medium-sized and larger towns, partly as a result of a much higher than usual turnout among the government’s opponents in these areas. In November, Law and Justice once again found itself on the defensive following media reports of a recording which appeared to show that the head of Poland’s financial supervisory commission (KNF) Marek Chrzanowski was involved in a 40 million złoty bribery solicitation from the owner of Getin Noble Bank Leszek Czarnecki; an allegation which Mr Chrzanowski vehemently denied. The scandal posed huge risks for Law and Justice because the party has made reforming state institutions to raise moral standards a core element of its ethical legitimation and political appeal. Law and Justice’s 2015 electoral success was based in large part on promising clean and honest government and portraying itself, in apparent contrast to its predecessor – led by the liberal-centrist Civic Platform (PO) party, currently the main opposition grouping – as representing the interests and values of ordinary Poles rather than venal and self-serving political and business elites. Consequently, Law and Justice moved quickly to force Mr Chrzanowski to step down and order state agencies to investigate the allegations. The opposition argued that the investigator’s delayed response allowed Mr Chrzanowski to clear his office, and called for a special parliamentary commission to investigate the scandal. Moreover, although Law and Justice was at pains to point out that Mr Chrzanowski, a former central banker, was not a political figure, he was nominated to his post in 2016 by Mrs Szydło at the recommendation of Adam Glapiński, the head of the of the National Bank of Poland (NBP) and long-time political ally of Law and Justice leader Jarosław Kaczyński. Up until now, the scandal has not developed sufficient momentum to really damage the government and Law and Justice is hoping that it will fade with the passage of time. However, experience suggests that the impact of high profile scandals such as these can often be delayed, gradually chipping away at the governing party’s credibility until a further (sometimes relatively minor) incident or revelation acts as a tipping point and shifts the public mood very quickly. In this case, it could be the emergence of new recordings damaging to the government. Finally, at the end of the year the government was embroiled in concerns as to how it intended to protect households, firms and local authorities from surging electricity price increases being proposed by state-run power vendors. In the event, it avoided the crisis by pushing through emergency legislation giving tax relief to electricity consumers and providing compensation for utilities, which it promised would guarantee that prices would remain unchanged in 2019. Law and Justice’s strategy for regaining the political initiative is based on trying to persuade moderate voters to focus on the government’s achievements in delivering on its highly popular social spending promises while maintaining economic growth and fiscal stability. The party’s approach is aimed at winning over undecided and passive non-voters who are not particularly interested in politics by offering them socio-economic stability and prosperity, and re-assuring them that politics will be quieter and less turbulent moving forward. It appears to be learning from its mistakes and getting better at portraying Poland as a stable and secure country under its leadership. Although Law and Justice’s support has fallen back recently, it continues to enjoy an average of around 40% in opinion polls, ten percentage points ahead of Civic Platform, and remains on course to emerge as the largest party after the parliamentary election, although whether it will be able to continue to govern without coalition partners is much more uncertain. At the same time, drawing lessons from the local elections, the ruling party is trying to lower the temperature of the political debate and downplay more controversial issues in order to avoid mobilising the anti-Law and Justice electorate. This has included trying to defuse the party’s row with the EU institutions by withdrawing some of the most contested elements of its judicial reform programme in order to neutralise the opposition’s apparently effective – and, from Law and Justice’s perspective, extremely dangerous – claim that the party wants to take Poland out of the Union (so-called ‘Polexit’). It also involves distancing the party from attempts by Catholic-inspired civic organisations to further tighten Poland’s already restrictive abortion law, an issue that is felt to mobilise anti-Law and Justice voters in urban areas. The nightmare haunting Law and Justice is that the next election becomes a repeat of the 2007 snap poll when, as the incumbent, it mobilised its core supporters and even increased its share of the vote on the back of a strong economic performance, but ultimately lost because larger numbers turned out to vote for Civic Platform which promised a calmer and more stable political environment. Moreover, the political formula that worked so well for Law and Justice in 2015 – when it won support from voters not altogether convinced by its radical critique of the functioning of the post-1989 Polish state but disillusioned with the former governing elites and attracted by the party’s social policies which held out the promise that they could share more fully in the country’s economic success – is slowly becoming exhausted. It will be difficult for Law and Justice to match the high profile spending pledges that were the key to its election victories; although it is apparently planning a series of new policy initiatives focusing on tax cuts in the New Year. Moreover, even when Law and Justice is appealing on bread-and-butter issues, the nature of the party is such that it needs to locate its socio-economic policies within a broader political project, which makes it difficult to portray a purely technocratic-centrist image. At the same time, the governing camp is not always consistent in pursuing its strategy of winding down conflicts, with many commentators citing justice minister Zbigniew Ziobro, who is on bad terms with Mr Morawiecki, as the worst offender. They argue that Mr Ziobro ignited the ‘Polexit’ debate by asking the constitutional tribunal whether Polish judges had the right to refer queries on EU law to the European Court of Justice, which the opposition interpreted as a possible pretext for Poland to ignore the Court’s verdict. The justice ministry also shifted public attention back on to the financial regulation scandal by arresting former heads of the supervisory body for alleged negligence in their oversight of the SKOK Wołomin credit and savings union, which went bankrupt in 2014. Critics argued this was a ham-fisted attempt to distract from Mr Chrzanowski’s arrest. But Mr Ziobro is difficult to sack because he leads the ‘Solidaristic Poland’ (SP) party, a small grouping but one which, if it stood independently from Law and Justice, could deprive the ruling party of victory. An even greater threat would be if he joined up with a potential new right-wing challenger party that could emerge from the milieu linked to the Catholic broadcaster Radio Maryja, which is very influential among Poland’s ‘religious right’ electorate. Still more credible on issues Poles care about? Finally, Law and Justice’s electoral prospects also depend upon whether the liberal-centrist opposition can mount an effective challenge. For sure, it retains considerable cultural, financial and media assets, and enjoys close links with the EU political establishment. It is also helped by the fact that the European Parliament (EP) election, where turnout is very low but higher in the urban areas that the opposition enjoys stronger support in, will be held in May. A good performance here could provide it with valuable momentum in the run-up to the autumn parliamentary election; one of the reasons why Law and Justice is considering bringing the latter forward to the spring. However, the opposition lacks convincing leadership around whom the government’s opponents can unite and rally around. Civic Platform leader Grzegorz Schetyna is an effective political operator who has emerged as the undisputed leader of the opposition, but lacks dynamism and charisma, and his ruthlessness has made leaders of smaller opposition groupings wary of working too closely with his ‘Civic Coalition’ (KO) electoral alliance. Moreover, the opposition still lacks an attractive programmatic appeal on socio-economic issues. Mr Schetyna’s strategy, of hoping that Poles will simply rally around whoever happens to be the main alternative to the incumbent, worked reasonably well in urban areas during the local elections but a more positive approach will be needed to win a national poll. Although Poles will not vote for Law and Justice out of gratitude, the fact that the ruling party has fulfilled the majority of its social spending promises gives it much greater credibility than the opposition on those issues that voters appear to care most about. I guess the year had too much happening for a one-article summary! You forgot to mention that following the ministerial bonuses scandal, not only did Kaczyński force the PiS ministers to give their bonuses to the Catholic charity Caritas, but he forced a salary cut of 20% on all elected politicians in the country (national and local)! Needless to say, the nation complied with barely a whimper, indicating that Kaczyński remains the all-powerful populist leader despite his mysterious health problems. This would be impossible in a Western democracy. A couple of more recent affairs are going to also haunt PiS. 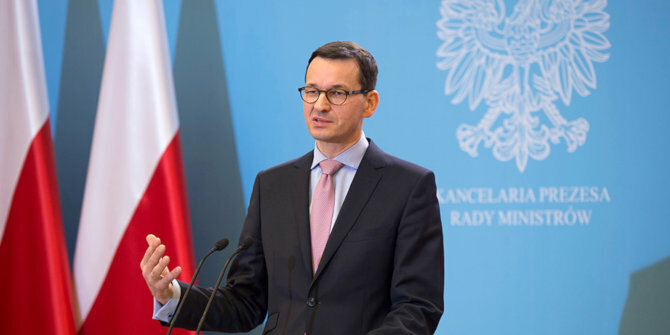 Firstly, Premier Mateusz Morawiecki has anounced that electricity bills will not rise, despite the cost to Poland rising by many billions of zloties. This is just postponing the blow until after the elections, a blatant ploy, but perhaps not understood by the rural base which receives only the state propaganda media. Secondly, PiS has just appointed as Deputy Minister for Digitization a recent leader of the fascistic ONR and All-Polish movements, Adam Andruszkiewicz, with a rich history of recorded racist and homophobic speeches. People are scratching their heads to understand this move, but it appears to be quite deliberate and no doubt based on PiS’ polling, on which it spends vast sums. Given the huge turnout for the far-right Liberation Day march in Warsaw on November 11, this may be a calculation which is being totally missed by the liberal opposition. Kaczyński, of course, has an explicit policy to never be out-flanked on the right, and no doubt is troubled by Father Rydzyk’s threat of putting up a far-right party, at a time when PiS has relegated extremists such as Antoni Macierewicz and Krystyna Pawłowicz to the sidelines before the elections. The centre-left coalition is not forming well. A split in Nowoczesna and Schetyna’s apparent gobbling up of half of Nowoczesna’s remaining caucus has (unfairly) hurt the Civic Coalition project, while the left (SLD, Razem and Biedroń) is no closer to any move toward unity either as a united Left or joining up with the liberal Civic Coalition. Only Barbara Nowacka with her tiny but very active Polish Initiative, having joined the Civic Coalition, has any new ideas and is gaining public respect. An ideal situation would be for Schetyna to act just as Kaczyński did with Beata Szydło in 2015 and put up Nowacka as the Civic Coalition candidate for Premier (which she was at the head of the United Left in 2015), but I seriously doubt that Poland is ready for her in that position, although her ideas have considerable support (imagine a more restrained Jacinda Ardern or Alexandria Ocasio-Cortez). It is too late for Schetyna to be replaced, and this is his chance to take charge. He is a totally ruthless operator. However, Nowacka appears to have a lot of influence with him and other Civic Platform leaders, judging by the prominence Schetyna gave her and her planks in the municipal election campaign. Lastly, it is widely speculated that Kaczyński will bring forward the parliamentary elections from October to May or earlier, since PiS’ poll numbers are dropping, the Polish hardly Catholic Church is finally facing its pedophilia comeuppance, PiS may not do well in the EP elections in May, and the opposition may unite by October. For this, a procedural trick with the budget approval process must be employed, and this will come to a head in late January. Holding the Sejm and European Parliament elections together is probably the best chance PiS has to retain power in Poland or even increase its majority, as well as doing better in the EP election thanks to the higher rural turnout for Sejm elections. The Liberal political lines has destroyed many countries in vest Europe. Specifically in Sweden. France and Germany has bad agenda. Parliament elections should never be a positive factor for Poland. I’m self from Norway, and here things are getting more costly, and violence because the liberals, /Sosialistisk democracy is not the real fact. We have illiberalt democracy. . Take care of Poland, and never feel responsible for country outside Europe.. The biggest mistake in history.. EU must reforms to. Greetings from Oslo.